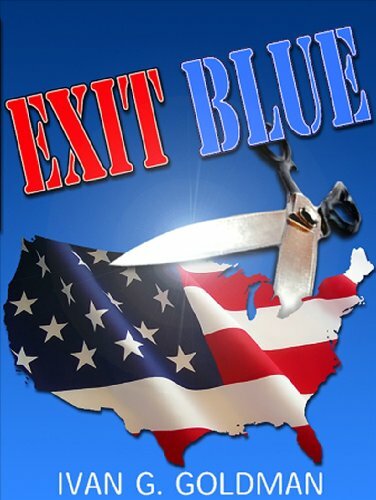 In the future, the Blue States have seceded from the union. The country is broken up into two different areas. Blue States are the democratic states and have their own laws and ways of doing things. Red States, or republican states, are run in their own chaotic fashion. Both sides are in a sort of war and neither can see eye to eye. Delmore LeCorte used to be living high until his father-in-law throws him to the wolves in a nasty corporate scandal. Fresh out of rehab, Delmore finds that things have changed quite a bit on the outside, and not for the better. He’s now facing the loss of his family as well as being homeless and jobless. Under the instructions of a ‘friend’, he visits a well-known journalist who gives him a rather confusing job. Del is slated to go under cover and write a tell-all book about the blue states. I found this book to be quite an enigma. On one hand, we have the political satire, but on the other we have amazing creativity beating us over the head. It seems that throughout the book both are at war with each other. I found myself tuning out in spots because I just couldn’t force myself to read one more dry word. Other places in the book, I couldn’t stop giggling at the sheer hilarity. It was a mixed book for me. Half of it I loved, while the other half I despised. For me, the best part of the book had to do with the characters. They’re well-drawn and imagined. Every single characters has some lively trait that just pulls them to the front of your brain and keeps them there until the next comes along to replace it. I found myself being reminded several times of the film ‘Idiocracy’. In the film, it’s the future and mankind has turned into dullards. The Red States remind me of valley girls and frat boys in the same manner. The fact that they’re able to keep the states running at all is a miracle. The biggest downfall to this book for me came with the political aspects. I’m not the world’s greatest authority on politics and most of the time I couldn’t care less what’s going on where they’re concerned. That may make me a bad American, but it’s the truth. Though the politics are written in this book with a definite flair to make it more entertaining, unless you have a basic knowledge of politics, most of what’s happening is going to be completely lost on you in the beginning. I found that I had to do a bit of research in order to know what was happening in the first few chapters. Once I’d finished that, however, reading it became much more simple and enjoyable.